2001-11-06 Application filed by Lev Tsvi H., Ofer Bar-Or filed Critical Lev Tsvi H.
2002-11-12 Assigned to EMBLAZE SYSTEMS, LTD. reassignment EMBLAZE SYSTEMS, LTD. ASSIGNMENT OF ASSIGNORS INTEREST (SEE DOCUMENT FOR DETAILS). Assignors: BAR-OR, OFER, LEV, TSVI H.
An object identification method for wireless portable devices for a user equipped with a portable wireless imaging device to be able to obtain information and services related to imaged objects, where the object identification is performed at least partially by a remote computational facility, and where the object identification is based on acquired images of the object. 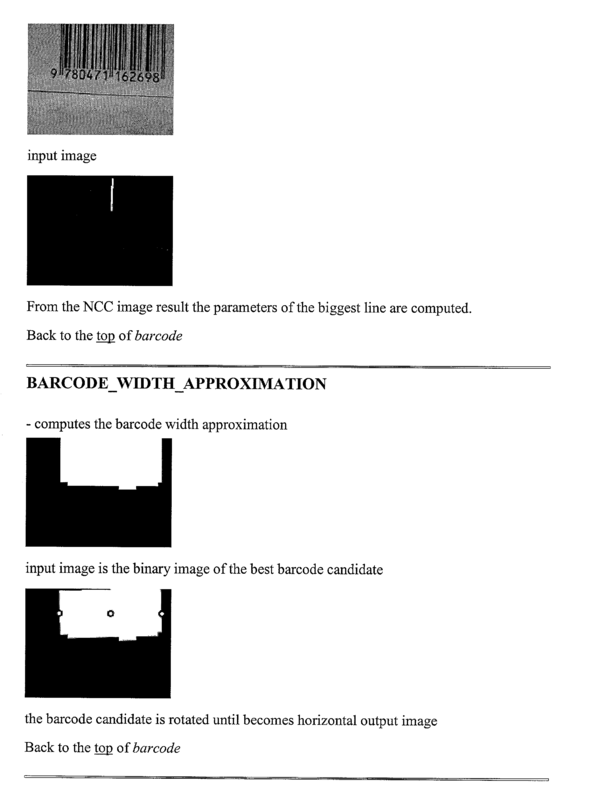 The method includes an imaging device, capable of taking one-dimensional or two dimensional images of objects; a device capable of sending the coded image through a wireless channel to remote facilities; algorithms and software for processing and analyzing the images and for extracting from them symbolic information such as digits, letters, text, symbols or icons; algorithms and software facilitating the identification of the imaged objects based on the information gathered from the image and the information available in databases; and algorithms and software for offering various information or services to the user of the imaging device based on the information gathered from the image and the information available in databases. The present application is based on Serial No. 60/245,661 filed on Nov. 6, 2000, the contents of which are hereby incorporated by reference. To the accomplishment of the above and related objects, this invention may be embodied in the form illustrated in the accompanying drawings, attention being called to the fact, however, that the drawings are illustrative only, and that changes may be made in the specific construction illustrated. FIG. 4 is a data flow chart according to an embodiment of the invention. Item  101 is the imaging device, as described previously. In terms of novel additions, the imaging device may contain image compression algorithms specially optimized for the task of image compression for optimal identification rather than optimal appearance. For example, for the identification of printed text/numerals. The system can convert the image into a binary black and white image for better compression, even though it makes the image less visually appealing. Potentially, the device may run specific software—e.g. 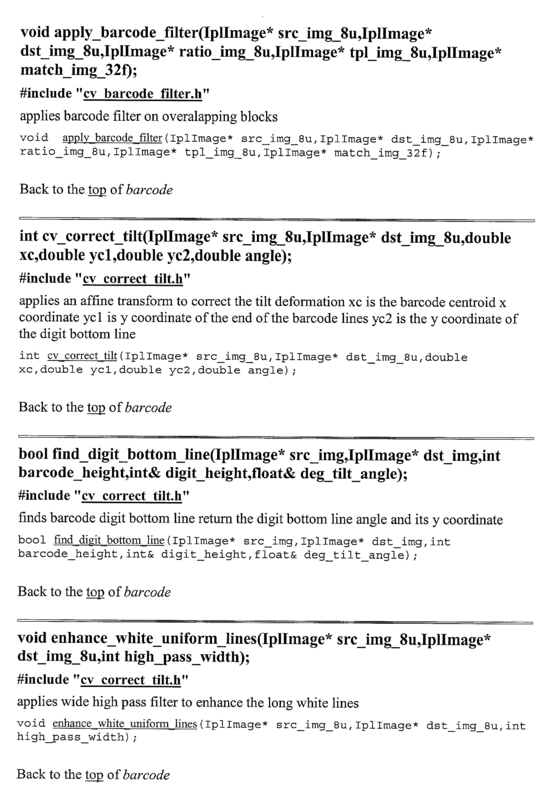 code written In J2ME, to optimize the image taking operation. In item  102 the imaging operation is performed through the camera Field Of View (FOV). 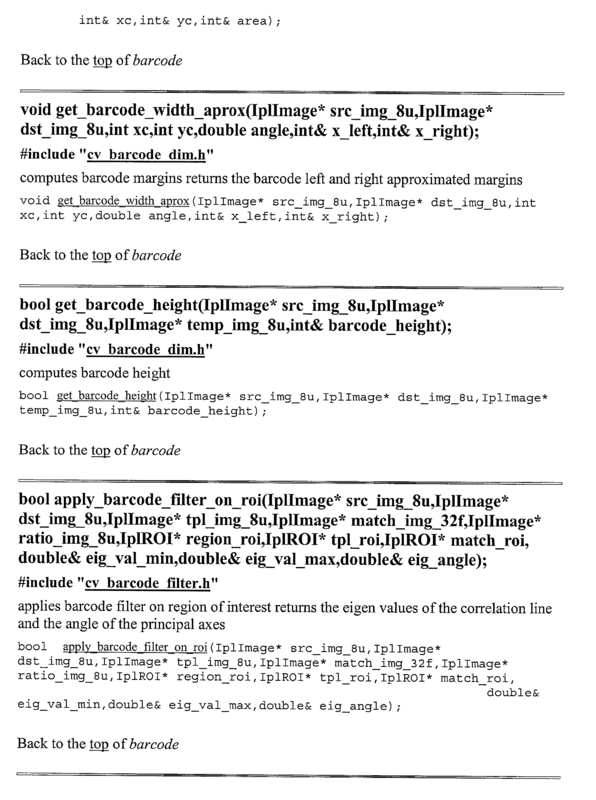 Part of the novelty of the invention lies in the understanding that through the remote server one can stitch several images to form the complete image required for identifying the object (see also FIG. 4). 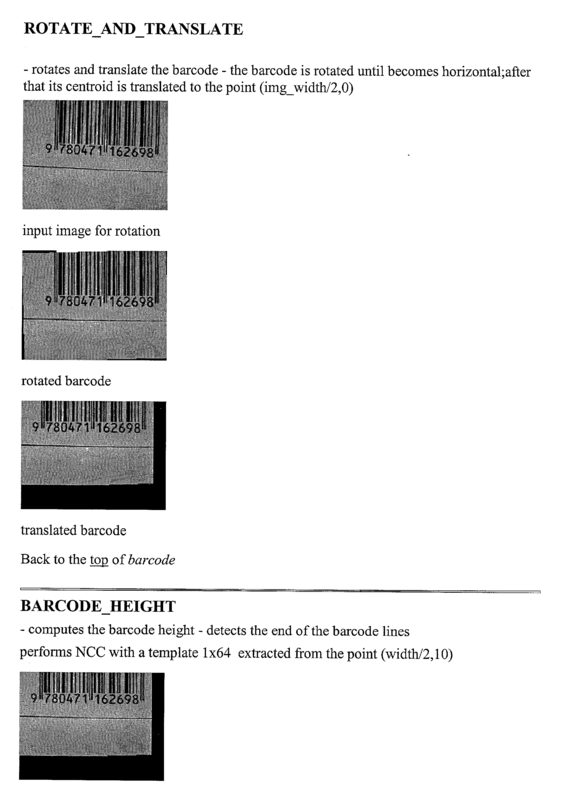 Item  103 represents a potential identifying mark, such as a barcode. 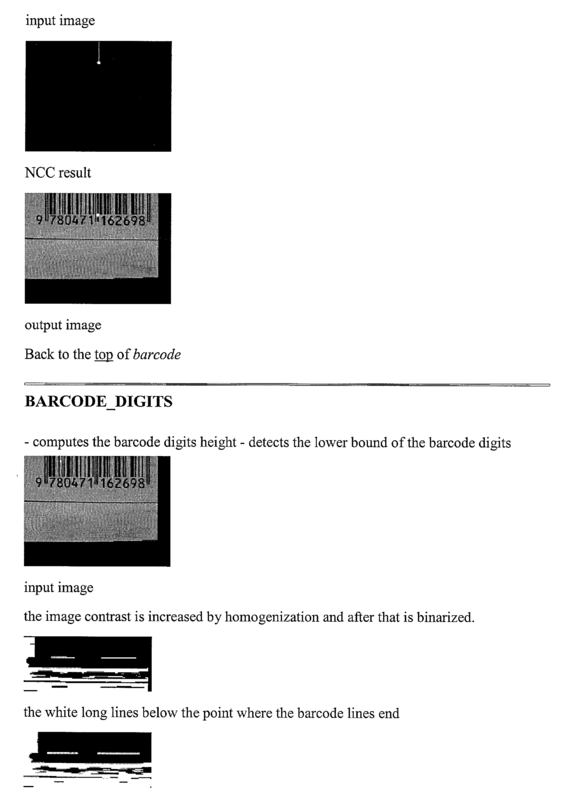 One aspect of the novel method is that the barcode is not read using a specially designed device but rather using a general purpose imaging device. 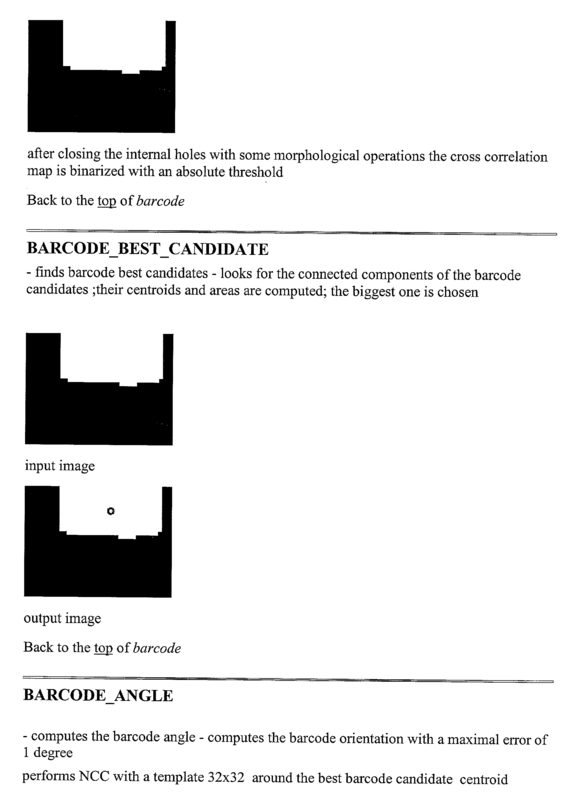 Item  104 represents another potential identifying mark, such as the printed text in a document. In the case of e.g. a newspaper, the headings or even just fragments of text in a story/advertisement could serve as identifying information. In item  105, once the image or set of images is acquired it is transmitted through any wireless/wireline combination of data transmission paths to the remote server. The remote server could be far apart e.g. in the central office of a wireless cellular operator, or it could be a few meters away from the imaging device and connected to it by a WLAN such as Bluetooth. Item  106 is the remote server, which then proceeds to apply the described sequence of algorithms, which can be a combination of known and novel algorithms. 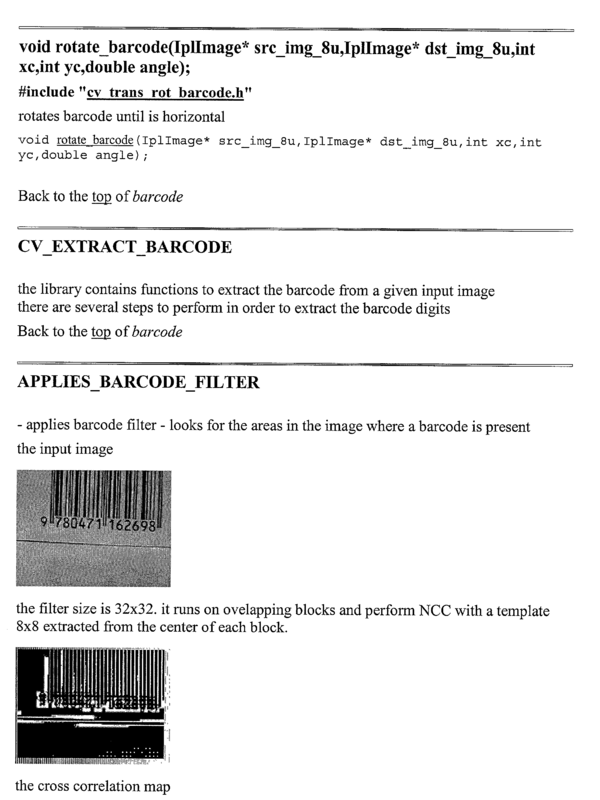 Appendix A provides a detailed description of the algorithms for barcode detection and decoding. The processing server applies such sequences of algorithms that result in the identification of the imaged object. Item  107 is the remote server itself (or a different remote server connected to it). Server 107 can, based on the object identification information, extract information about the object from databases/public data networks such as the internet. For example, the ISBN number of a book could be used to perform an HTTP GET request to a web site such as Amazon in order to retrieve the product's price, reviews about it etc. Item  201 is the imaging device (as described as item 101 in FIG. 1). Item  202 is the image of a standard UPC barcode on a commercial product. Item  203 is the part of the image that has been extracted by either the imaging device or by the remote server and contains the information necessary for object identification. The algorithms required to implement this stage are described in Appendix A. Item  204 is the string of identifying numbers that has been extracted using algorithms such as those described in Appendix A. Item  205 is the server, which then formulates e.g. an HTTP request or a database SQL query to retrieve more information about the product—e.g. price, availability, qualities, rating, limitations on sale etc. Item  206 is the target device. 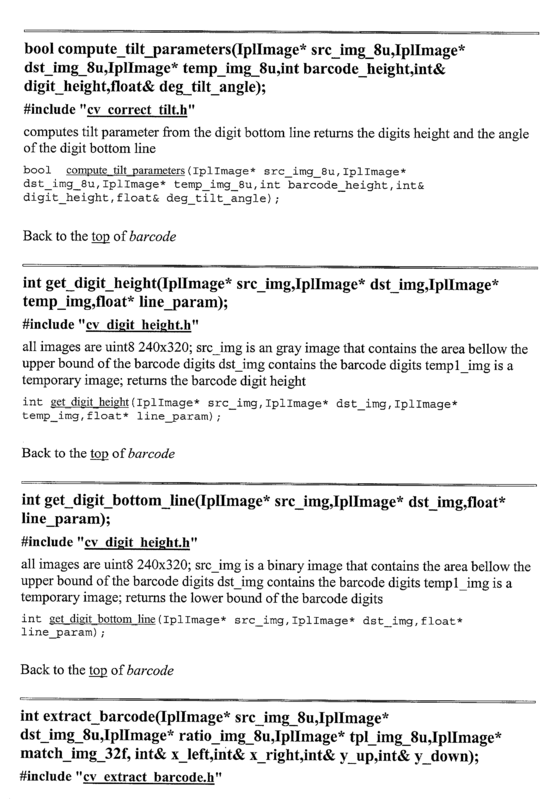 The retrieved information is then reformatted for display on the screen of the target device—so for example graphics may be taken out or reduced in color depth or size before they are sent to the device 206, and the binary format in which they are packaged has to be adapted to the recipient device. This can be done by the remote server or by a different entity. In item  207 the server's response may include menu options and perform activities on the display device, so the product can be bought or inquired about. Item  208 shows that the same information (or more information) can also be sent aft to other display devices such as the user's personal computer, e-mail account etc. This can enable richer interaction at a later time when the user is near a more powerful device. The content is adapted in any case to the different target devices. Item  301 is the imaging device (as described as item 101 in FIG. 1). Item  302 is the image of a part of a newspaper page. Item  303 is the image after image processing operations have been performed on it to decrease the file size and/or improve the object identification's chances. In this example the image is binarized after some local histogram equalization operations. 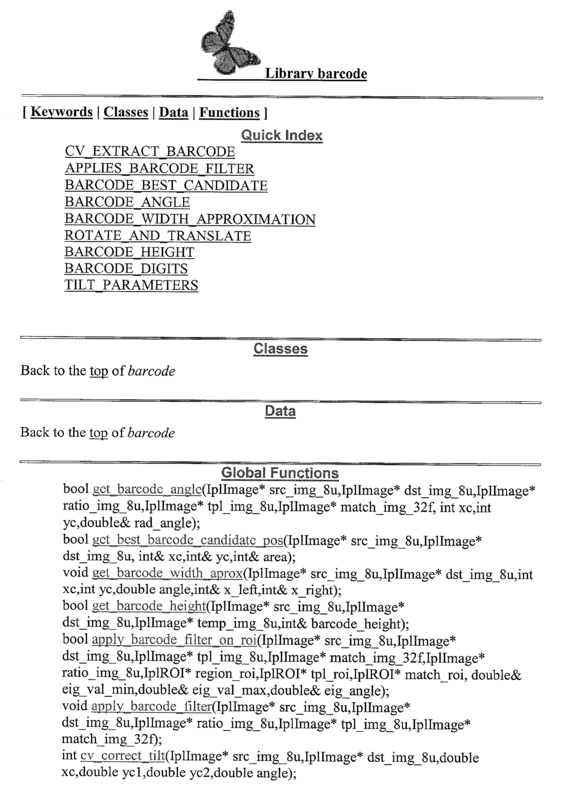 In item  304, the OCR engine running on the remote server identifies the part of the image containing legible text and extracts the maximum number of characters and their relative geometrical position. This information is then used, in conjunction with a database of the newspaper itself, to identify the relevant story/segment. It should be noted that for identification purposes even a very partial success in the character recognition task should be sufficient. In item 305, again the results are reformatted and transcoded optimally to the target device—which is not necessarily the original imaging device 301. Item  401 is the imaging device (as described as item 101 in FIG. 1). Item  402 is another potential imaging device with a line scanner rather than a two dimensional imager. Item  403 is the data transmission apparatus in cases where the image acquisition part of the device is connected to the data transmission apparatus through a cable or some special wireless connection. Item  404 is the original acquired image prior to any manipulation. Item  405 is the compressed image prior to sending, where the image compression parameters and algorithm may have been optimized for object identification purposes rather than for visual appeal. Item  406 is the remote server system, which may be comprised of a series of servers where the image processing operations between these servers are distributed (either on a per image basis or on a per-request basis) for optimizing the computational resources and/or the total response time. The distribution may be performed via commercial load balancing equipment or by proprietary load balancing software. Items  407 and 408 are two separate images that have been acquired and can be stitched together in the remote server to form one complete image. 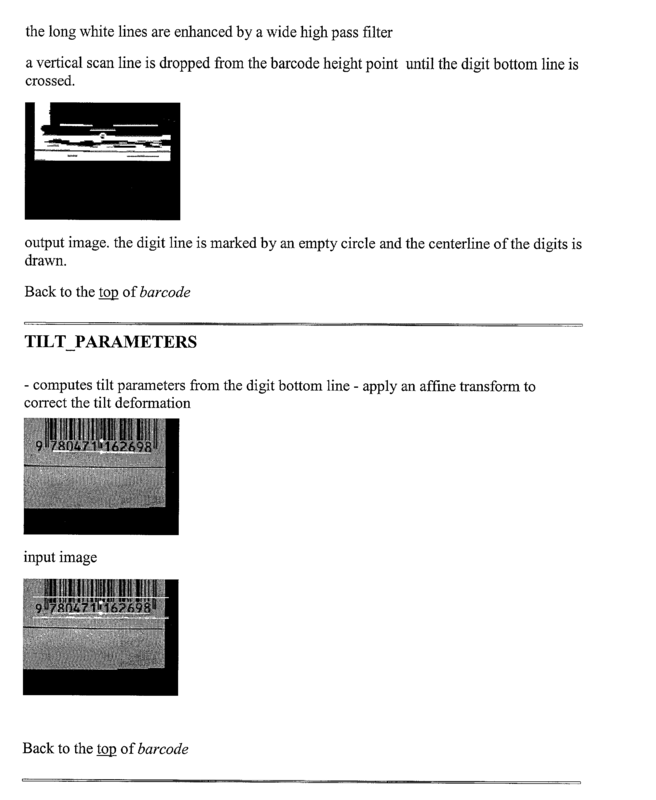 Item  409 the image is then rotated to the right angle for OCR detection (see Appendix A for a detailed discussion of this operation), where the algorithm measures the image angle using the line pattern of the barcode. In item  410, the part of the image containing numerals is extracted using a special algorithm (see Appendix A). 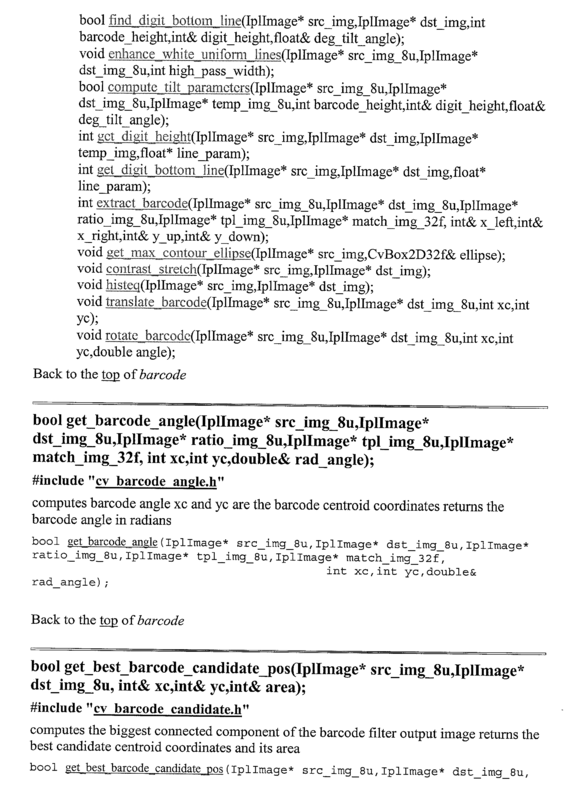 In item  411, OCR operations then take place on the remote server, where again parallel processing may take place to enable testing many more image parameter configurations or OCR fonts, or several different OCR engines may be run in parallel and the final result determined by some form of voting mechanism. In item  412, the string of the decoded numbers (which may contain some errors) is sent for interpretation to better decide e.g. the type of the barcode (UPC,EAN, some proprietary format etc.). Some error correction algorithms may be used at this stage to utilize the inherent redundancy in the digits to correct for identification errors. 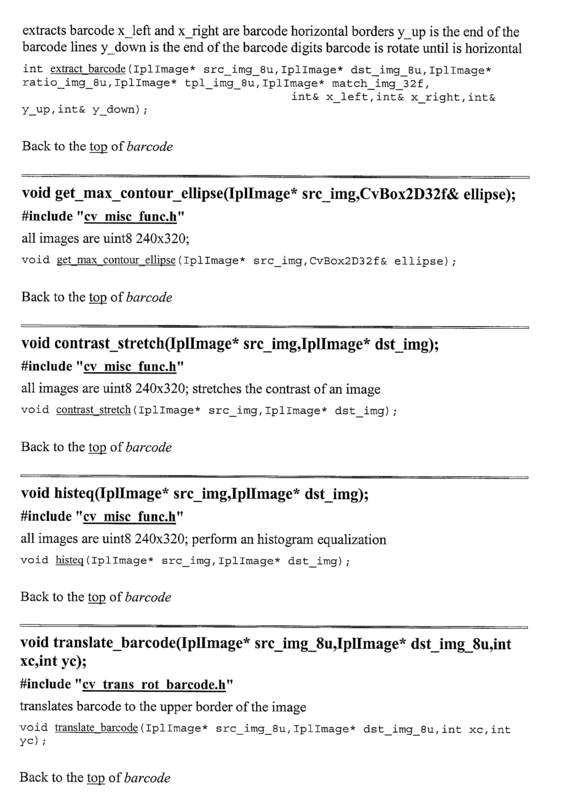 Finally, in item 413, the extracted text is sent to other computer lingual interpretation. The imaging device  101 is a unit capable of acquiring images, storing and/or sending them. The wireless device is capable of sending images to remote facilities. The algorithms perform compression artifact correction, noise reduction, color corrections, geometric corrections, imager non-uniformity correction, etc., and various image processing enhancement operations to better facilitate the operation of the next stage of image understanding algorithms. The algorithms are implemented as a plurality of software objects residing on one or more computational devices. Also included are algorithms performing, among other operations, digit recognition, printed and handwritten text recognition, symbol, logo and watermark recognition, and general shape recognition. The algorithms are implemented as a plurality of software objects residing on one or more computational devices, possibly including the imaging device and/or the wireless device. Software for utilizing the information extracted in the previous computation stages for data storage, extraction and/or communication with a plurality of internal and/or external applications, such as databases, search engines, price comparison sites etc. The imaging device  101 is a unit capable of acquiring images, storing and/or sending them. The imaging device is a device capable of capturing single or multiple images or video streams and converting them to digital information. It is equipped with the proper optical and electro-optical imaging components and with computational and data storage components. The imaging device can be a digital camera, a PDA with an internal or external camera, a cellular phone with an internal or external camera, or a portable computational device (e.g. laptop, palmtop or Webpad™-like device) with an internal or external camera. (e) application software that allows the remote server to acquire additional information about said object. 2. The system set forth in claim 1 further comprising a wireline communication link between the communication device and the remote server. 3. The system set forth in claim 1, wherein the additional information is services. 4. The system set forth in claim 1 wherein the imaging device is separate from the communication device in element b, but these two devices are linked electronically. 5. The system set forth in claim 1 wherein the imaging device and the communication device are comprised of only one device that performs both imaging and communication. 6. The system set forth in claim 2 wherein the communication device is a PDA. 7. The system set forth in claim 3 wherein the communication device is a PDA. 8. The system set forth in claim 4 wherein the imaging device is a PDA. 9. The system set forth in claim 5 wherein the single device for imaging and communication is a PDA. 10. The system set forth in claim 3 wherein the communication device that performs the communication link with the remote server is a cellular telephone. 11. The system set forth in claim 4 wherein the communication device is a cellular telephone. 12. The system set forth in claim 5 wherein the single device for imaging and communication is a cellular telephone. 13. The system set forth in claim 1 wherein the basic information includes at least one piece of information from the group consisting of the device/user location, the user profile, previous user actions, the user's textual inputs, the user's manual inputs, and the user's acoustic inputs. 14. The system set forth in claim 2 wherein the basic information includes at least one piece of information from the group consisting of the device/user location, the user profile, previous user actions, the user's textual inputs, the user's manual inputs, and the user's acoustic inputs. 15. The system set forth in claim 3 wherein the basic information includes at least one piece of information from the group consisting of the device/user location, the user profile, previous user actions, the user's textual inputs, the user's manual inputs, and the user's acoustic inputs. 16. The system set forth in claim 4 wherein the basic information includes at least one piece of information from the group consisting of the device/user location, the user profile, previous user actions, the user's textual inputs, the user's manual inputs, and the user's acoustic inputs. 17. The system set forth in claim 5 wherein the basic information includes at least one piece of information from the group consisting of the device/user location, the user profile, previous user actions, the user's textual inputs, the user's manual inputs, and the user's acoustic inputs. 18. The system set forth in claim 6 wherein the basic information includes at least one piece of information from the group consisting of the device/user location, the user profile, previous user actions, the user's textual inputs, the user's manual inputs, and the user's acoustic inputs. 19. The system set forth in claim 7 wherein the basic information includes at least one piece of information from the group consisting of the device/user location, the user profile, previous user actions, the user's textual inputs, the user's manual inputs, and the user's acoustic inputs. 20. The system set forth in claim 8 wherein the basic information includes at least one piece of information from the group consisting of the device/user location, the user profile, previous user actions, the user's textual inputs, the user's manual inputs, and the user's acoustic inputs. 21. The system set forth in claim 9 wherein the basic information includes at least one piece of information from the group consisting of the device/user location, the user profile, previous user actions, the user's textual inputs, the user's manual inputs, and the user's acoustic inputs. 22. The system set forth in claim 10 wherein the basic information includes at least one piece of information from the group consisting of the device/user location, the user profile, previous user actions, the user's textual inputs, the user's manual inputs, and the user's acoustic inputs. 23. The system set forth in claim 11 wherein the basic information includes at least one piece of information from the group consisting of the device/user location, the user profile, previous user actions, the user's textual inputs, the user's manual inputs, and the user's acoustic inputs. 24. The system set forth in claim 12 wherein the basic information includes at least one piece of information from the group consisting of the device/user location, the user profile, previous user actions, the user's textual inputs, the user's manual inputs, and the user's acoustic inputs. (e) a means for displaying said processed data and additional information or services about said at least one object. (e) displaying said processed data and additional information or services about said at least one object. EP1573622A1 (en) * 2002-11-29 2005-09-14 Publigroupe SA Method for supervising the publication of items in published media and for preparing automated proof of publications.